While he doesn’t recommend rushing jobs, this project showed integrator Casey Johnston what is possible with the best equipment, extensive planning and an experienced team. PETALUMA, CALIFORNIA, February 13, 2018 — Once you’ve installed complete control and audio/video solutions in seven nearly identical restaurants, it can start to seem like a cookie-cutter operation. 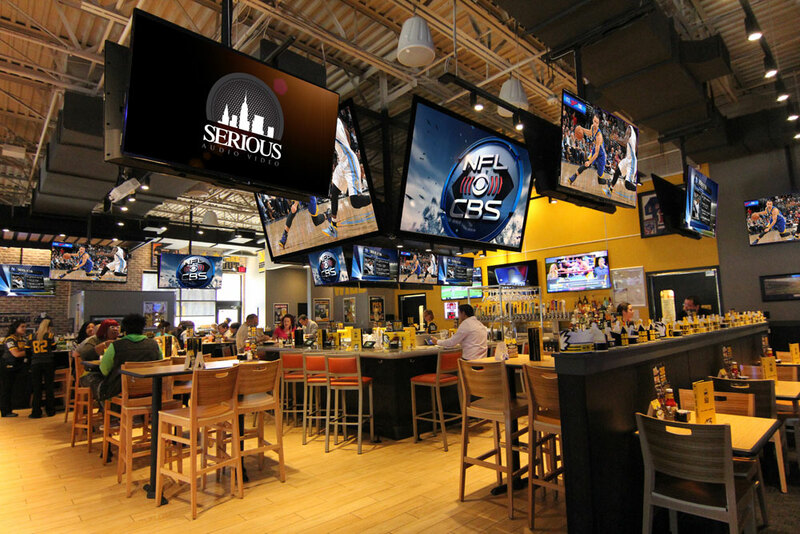 For Union City, N.J.-basedSerious Audio Video, however, the eighth ELAN control installation in a Buffalo Wild Wings location was anything but standard. Due to the company’s corporate mandate to redesign and upgrade each restaurant every seven years, the high-revenue North Brunswick, N.J. location was scheduled to be overhauled in 2017. As any business owner knows, you don’t want to interrupt a profitable operation, which meant that closing the location for four or five weeks was out of the question. According to Casey Johnston, Owner of Serious Audio Video, the time constraints made this an extremely high-stress job that required going way above and beyond the normal working call of duty. Luckily, the job centered around the easy-to-install, easy-to-use ELAN control system, ensuring that installation and configuration would be completed quickly. Such a rapidly moving and crowded construction site meant a lot of pre-planning was required, so Johnston worked for weeks ahead of time to ensure that every component was in hand, every drawing and design was correct, and every employee knew their role and responsibilities. And in this case, it was a major benefit that the team had installed several very similar ELAN systems for other Buffalo Wild Wings locations. Due to the new floorplan and interior design, the team had to relocate dozens of speakers and TVs as well as add 33 new Aquos display panels, mostly split between 60” and 80” models, plus four massive 90” models. Integrators know that uninstalling and reinstalling equipment is basically double the work. Six new Crown amplifiers replaced the existing equipment, and a Knoll projector paired with a 110” Dragonfly screen capped off the audio/video portion of the upgrade. For the control side, Serious Audio Video added a new ELAN gSC10 system controller, a S1616A Multi-Room Audio Controller, Xantech IR equipment, a Dell PC, an Apple iPort mount for an iPad with the ELAN app, and a 17” Planar touchscreen that provides an interface in the equipment rack. For hi-res images, click here. ELAN, now part of Nortek Security & Control, develops an award-winning line of whole-house entertainment and control solutions distributed through a comprehensive channel of select dealers throughout the United States, Canada, and countries worldwide. The ELAN 8 update was honored with the “2017 Human Interface Product of the Year” award and continues to expand its intuitive functionality. To learn more, visit www.elanhomesystems.com. Nortek Security & Control LLC (NSC) is a global leader in smart connected devices and systems for residential, security, access control, and digital health markets. NSC and its partners have deployed more than 4 million connected systems and over 20 million security and home control sensors and peripherals. Through its family of brands including 2GIG®, ELAN®, GoControl®, Linear®, Mighty Mule® and Numera®, NSC designs solutions for national telecoms, big box retailers, OEM partners, service providers, security dealers and consumers. Headquartered in Carlsbad, California, NSC is a subsidiary of Melrose Industries PLC, a global investment company specializing in acquisition and performance improvement. With over 50 years of innovation, NSC is dedicated to addressing the lifestyle and business needs of millions of customers every day. For further information, visit nortekcontrol.com.